I told you I wasn't finished with New Look 6217 just yet! After helping my friend Emma to make her Budgie Skirt I had a sudden yearning to make another one for myself. The good thing about this pattern is that both front and back pieces are cut on the fold (the zip's in the side seam). So as long as you have a wideish piece of fabric where the selvedges can be folded into the centre, you only need a very small amount. 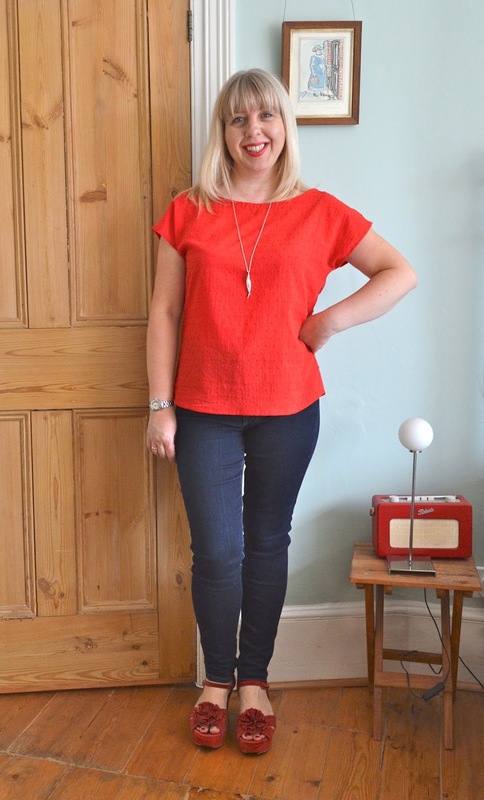 Gratifyingly I managed to use up the last half metre of stretch polka dot denim from my Ultimate Trousers, yes! I sewed a straight size 12 again, but could probably have done with sizing down at the waist as the fabric has so much stretch to it. I'm intending to wear this skirt a LOT over the coming months though, so it's nice to know I'll have a bit of a pie eating safety net built in! To finish the waist I made self bias binding instead of the twill tape the pattern specifies. Because of the stretch in the fabric I cut the binding on the straight grain instead of the bias and it worked a treat. But wait, there's more….. I picked up two lovely Swiss Dot cottons (one red, one navy) at the Fabric Godmother Open Day on Saturday and the red one seems to have magically transformed itself into a New Look 6217 top! 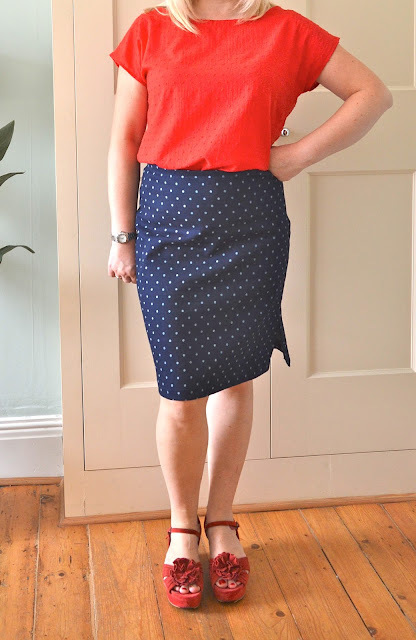 I've used Swiss Dot fabric once before when I made a sleeveless Granville shirt and it's perfect for summer dressmaking. I underlined the pattern pieces on that occasion as the fabric was very transparent, but didn't bother this time as the colour is much darker. The resulting top is beautifully light and airy for summer, I definitely think this pattern benefits from using a fabric with lots of drape. As before (here and here) I sewed a size 12 at the bust, grading down to a 10 at the waist and hips. I lengthened the pattern by one inch this time and it's a nice length on me either tucked in or untucked. 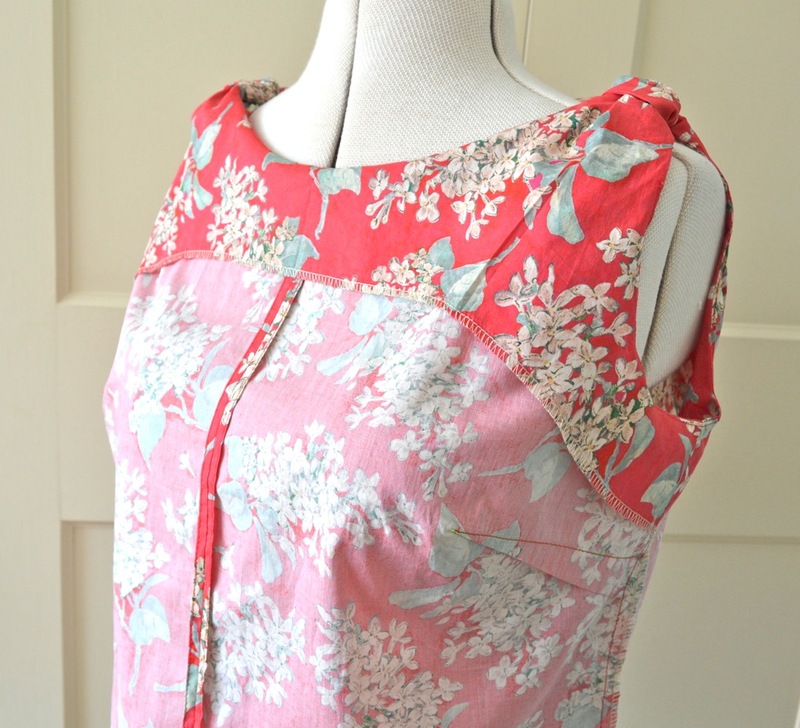 As the fabric is quite fine I used French seams throughout and finished the neckline with red bias tape from my stash. Easy peasy. It's also a perfect match with my new skirt! Have a good day! I'm very proud (and excited!) to announce that I've written a sewing book for children!! 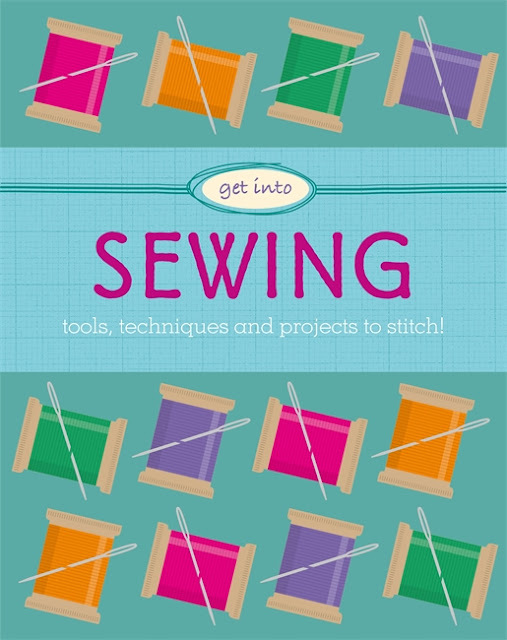 Get Into: Sewing will be published by Wayland Books on 8th September 2016. I know!! I can't quite believe it either!! 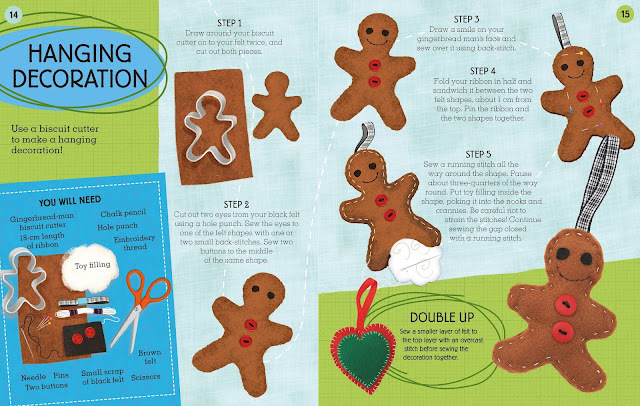 Wayland is a non-fiction children's publisher and Get Into: Sewing is part of a creative craft series designed to get kids interested in popular hobbies. I was commissioned to write the sewing title and I couldn't be prouder! Other titles in the series are Knitting, Gardening, Baking, Drawing and Photography, all due to be published in the autumn. It was great fun putting together the different projects in the book and I can't wait to share more of them nearer the release date. In the meantime, if you like what you see and have any children, nephews, nieces or friends who might enjoy it, it's available to pre-order on Amazon here!! Eeeeekkkkk! I hope you like it! July is all about vintage at the moment as stitchers across the land get well and truly involved with the Vintage Pledge July Extravaganza. This has been organised by Vintage Pledge hosts, Marie and Kerry and includes daily guest bloggers, a month long #vpjuly daily photo prompt on Instagram and LOTS of prizes. You can read more about what they have in store throughout the month here. 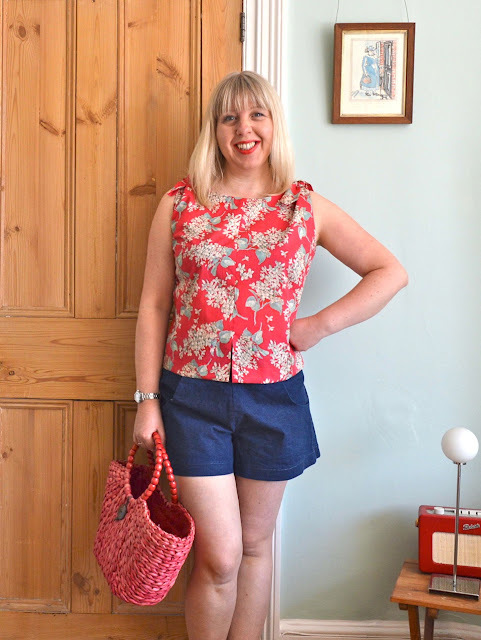 I was delighted to be one of the guest bloggers and the summer top I made from a vintage pattern was featured on A Stitching Odyssey last week. I'm posting pictures and details on my blog again today, just in case you missed it! The pattern I chose was Woman's Own 5003 - a mail order pattern from 1961. 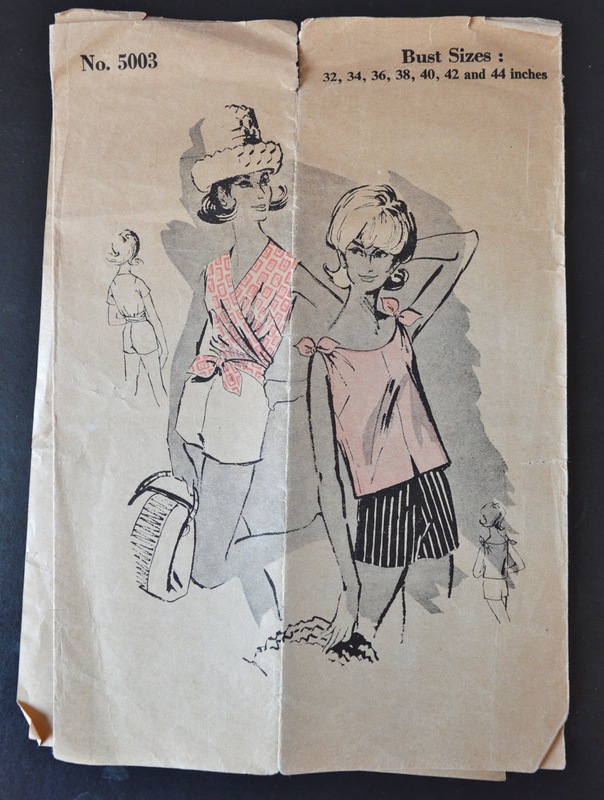 The pattern is for two different summer tops: a wrap top that can be made with or without sleeves or a boxy top with shoulder ties. By happy coincidence I bought the pattern from Vintage Pattern Pledge's Kerry when she was having a destash earlier this year! Isn't the envelope illustration adorable?! It's one of the main reasons I bought the pattern. Both tops are quite timeless designs and I could easily see the two styles slotting seamlessly into my wardrobe. It took me an age to decide which of the two versions to sew as I was drawn to both, but in the end the decision was dictated by the fabric. I knew I wanted to use this beautiful Liberty lawn Lilac print that I picked up on a day out with Ashley earlier this year. I absolutely love the colours, especially the contrast between the background red and the green leaves. It was available in lots of different colours when I bought it, but only seems to be listed in grey/lilac now unfortunately. Actually I think Charlotte used the same fabric (in a different colourway) to make her dressing gown on the Great British Sewing Bee. As we all know, Liberty lawn is ridiculously expensive, so I only bought a metre. It was only when I was inspecting the pattern that I realised a metre was never going to be enough to make the wrap/tie version, however skilfully I laid out those pieces. So the decision was made for me - the shoulder tie top it was. This is a very straight forward top to sew: a simple sleeveless tank with bust darts, slightly shaped side seams and a cute, notched bottom edge. The blouse also has separate shoulder ties/bows. The pattern was for a size 36 bust and the overall fit was pretty good. The only small changes I made were to lower the bust darts by an inch and add 1½" to the overall length. The instructions were brief, but perfectly clear and the whole top sewed together quickly. The necklines and armholes were given a lovely clean finish with an all-in-one facing - very satisfying! The shoulder ties are supposed to be threaded through buttonholes made in the shoulder facings. Sadly, my buttonholes foot isn't working at the moment, so I just knotted the bows around each shoulder instead - they seem to be working fine so far! The blouse has more of a boxy shape than I'm used to, but I still really like it. 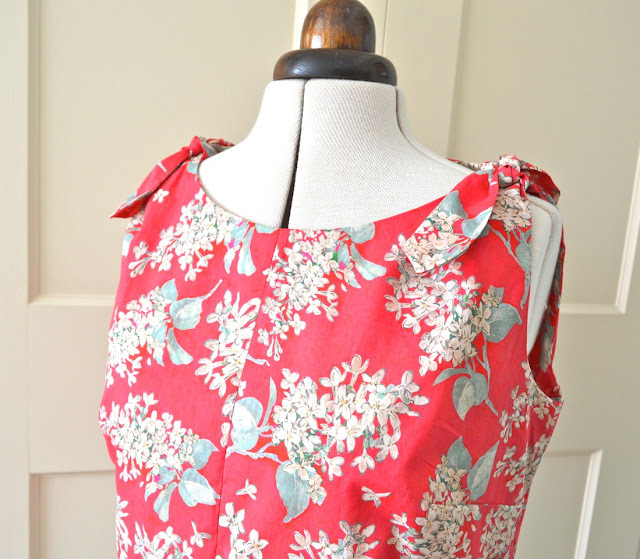 My favourite part is the shoulder ties - they give an otherwise plain pattern a lovely vintage twist. I'd love to try the sleeveless wrap version too at some point. Overall it's a perfect little blouse for summer and is a great match with my sailor shorts! This blouse counts as the second part of my Vintage Pledge for 2016. 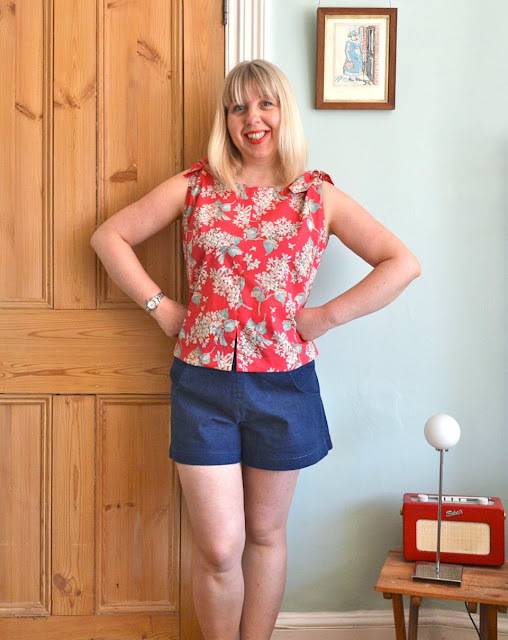 My pledge was to sew two items from vintage patterns - one suitable for winter and one suitable for summer. The winter part was taken care of when I made my Topper coat, so this here blouse is the summer part! Joining in with the #vpjuly daily photo prompts on Instagram has been enormous fun. 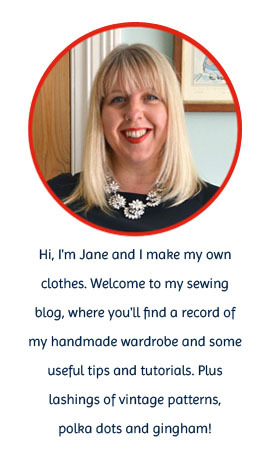 The vintage themed photos posted so far have been truly inspirational and I've discovered some great new bloggers to follow. If you want to check out what I've been posting you can find me on Instagram here (@janemarland). Recently I paid an impromptu visit to Walthamstow Market to meet a small posse of lovely sewing pals. I've only been to Walthamstow once before (it takes a lot to lure me east) and although I bought some weird and wonderful notions that time - red interfacing, polka dot elastic and lace trim - I didn't pick up any memorable fabric. On this recent trip, most of the fabric shopping had been done by the time I got there, but everyone was happy enough to make a return trip to TMOS (The Man Outside Sainsbury's) to humour me. Ah The Man Outside Sainsbury's - what a charmer! I swear he was flirting with me, and if I wasn't already married, I'd probably have asked him out... Before I knew it I'd bought two metres of peculiar looking fabric from my new boyfriend. It's a flesh coloured scuba (or neoprene?) with a layer of black lace attached. The flesh coloured fabric is a bit sinister looking on its own (think industrial strength support knickers) but is transformed by the lovely, delicate lace layer. In the photo below you can see the two layers attached in more detail - there's quite a sizeable selvedge area at each side. It wasn't just the charms of TMOS that lured me down this path, there is actually some method to my madness! Ever since I saw Karen's beautiful red lace dress I've been wanting to make a version of my own. I have the pattern picked out - Simplicity 1249 - and I've even purchased a Craftsy course to learn all I can about working with lace. But then this scuba upstart made an appearance and all my careful plans went out of the window. Making a lace dress would typically involve underlining the lace pieces, sewing a separate lining or both. Using my new fabric to make a lace dress would involve sewing the pieces together - and that's it. I still fully intend to make a properly constructed lace dress and learn the appropriate skills, but I'm also lazy! What I'm going to do is make a dress from the rogue scuba fabric as an experiment - if it all goes horribly wrong then I'll hardly have wasted any money (£4 a metre to be precise). It could look form fitting and classy and a lot more expensive than it actually is. Then again, it could end up looking like something a lady of the night might wear... I just need to dive in! My next step is to research tips for sewing with scuba knit. 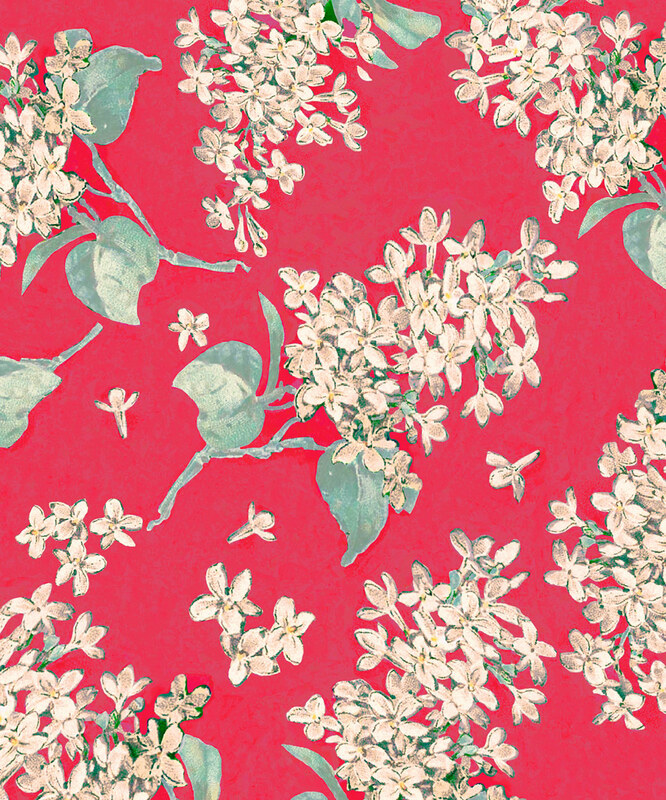 So if you've sewn with this fabric before and have any wisdom to share I'd be very grateful. Thank you friends!